I want to mention that this is the only one of my recipes that specifies all white flour, albeit organic and unbleached. My intention in 2006, when the recipe was published in More Great Good Dairy Free Desserts Naturally,* was to create a particularly delicate cookie, and without ‘vegan butter’ or granulated sugar. A few months ago, I decided to revisit the recipe wondering how a percentage of whole wheat pastry flour would work. Likely I wanted to feel better about offering my 1-year old grandson his first cookie. I began to test, and am now ready to share the new whole wheat pastry flour/white flour option which I find is less delicate, but tasty. You can cut the recipes in half and try them both. I’d love to know what you think. I generally make a double recipe and freeze well-wrapped packages of rolled-out dough and the cut cookies too. Then it’s just a matter of preheating the oven and baking at my convenience. Directions for my favorite finished cookies follow the recipe. I’m sure there are many others, which I leave to your imagination. Place a wire mesh strainer over a medium bowl. Add the flour, arrowroot, baking powder, and salt to the strainer and sift the ingredients into the bowl. Stir with a wire whisk to distribute and aerate the ingredients. Whisk the oil, maple syrup, and vanilla extract in a small bowl until thoroughly combined, and no traces of oil are visible. Pour into the dry mixture and mix with a rubber spatula until dough is smooth and shiny. Expect the dough to be soft. Divide the dough in half. Place each half on the center of a large piece of cling wrap. Pull both sides of the wrap over the dough, leaving room for the dough to expand, and press into a flat disk. Wrap tightly and refrigerate for at least 1 hour, or until the dough is very cold. The dough can chill in the refrigerator up to 4 hours, or be frozen for up to 2 months. When you are ready to shape and bake the cookies, position a rack in the middle of the oven and preheat to 350˚ F. Line a baking sheet with parchment paper. Spread half of the sugar on a flat plate. Remove one piece of dough from the refrigerator and unwrap. Put another piece of wrap on the dough, and roll into a round or oval shape, to about 1⁄4 inch thickness. You can roll the dough between pieces of parchment paper if you prefer. Use a wide spatula to lift each cookie onto the sugar. Sprinkle the tops of the cookies with sugar as well. Use the spatula to lift each cookie onto the prepared baking sheet, placing them 1/2 inch apart. If the cookies are too soft to lift, leave them on the wrap or parchment and pop them into the freezer for 10 minutes. Bake the cookies 8 to 10 minutes, or until the cookies look dry and slightly puffed, and the bottoms are lightly browned. Set the baking sheet on a rack and cool for 3 minutes, or until the cookies are firm enough to move. Transfer the cookies to a rack to cool completely. Roll, cut and bake the second piece of dough in the same fashion. Store the cookies in a tightly covered tin or jar at room temperature for up to 2 days. Freeze the cookies for up to 2 months. Use a 1/2 inch cookie cutter, or even a pastry tip, to cut the centers out of half the cookies. Bake as directed. Cool before assembling, following the Sandwich Cookies method. 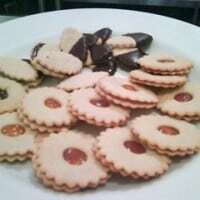 Sandwich Cookies: Spread a layer of an organic all fruit jam (a red raspberry or strawberry for Valentine’s Day), melted chocolate, or ganache on the bottoms of half of the cookies. Place another cookie, bottom-side down, onto the filling, and press lightly. Refrigerate until the filling is set. This will take 15 to 20 minutes. Chocolate Dipped Cookies: Dip each cookie halfway into melted chocolate. Refrigerate until the chocolate is set. Or dip the cookies into chocolate first, and immediately coat with some finely chopped nuts, or shredded coconut, or anything you like really! Chocolate Drizzle Art Wafers: Set the cookies close together on a flat tray lined with parchment. Dip the tines of a fork into melted chocolate and allow the chocolate to drip on the cookies, creating free form designs. All the other ingredients stay the same. Roll the dough to a scant 1/4 inch thickness. Here are more of VegKitchen’s Vegan Fine Pastry recipes. From More Great Good Dairy Free Desserts Naturally* by Fran Costigan. For more about Fran’s amazing pastries, visit FranCostigan.com.